By John F. McKenna (McJack): Manny Pacquiao (53- 3-2, 38 KO’s ) is perhaps the greatest fighter of his generation. The only other fighter who could legitimately compete with Manny for that mythical title is undefeated defensive genius Floyd Mayweather (41-0, 25 KO’s). Manny’s style is unorthodox and to some extent awkward. Other fighters who have attempted to emulate Manny’s style have come up short. He creates angles like no other fighter past or present, appearing, disappearing, shifting from one foot to another in a constant perpetual motion that baffles and confuses his opponents. 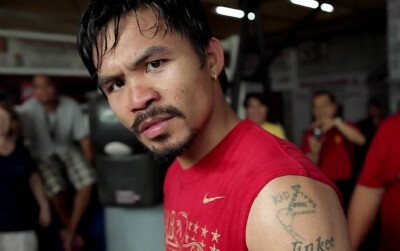 It is a style that is unique to Pacquiao and incorporates all his technical wizardry. It is also a style that he continues to work on and develop. He has the ability to strike with amazing force from any angle, even when off balance. Almost every fighter he faces underestimates his speed and opponents frequently are amazed at his power once they get hit by one of his lightning quick combinations. In Pacquiao’s recent fight with Shane Mosley, Mosley appeared to be in disbelief when he arose after being knocked down in the 3rd round. Mosley stated after the fight that he had never been hit as hard as he had been hit by Pacquiao. From that point on Mosley’s only concern was survival. Pacquiao credits watching a video of his idol Bruce Lee for his inspiration. Recently when he was preparing for his May 7 fight with Shane Mosley, Pacquiao was asked by reporters how he came to be the fighter he is today. He responded with just three words “Like Bruce Lee”. When Pacquiao was growing up in the Phillipines he watched Bruce Lee’s movies endlessly and has incorporated many of Lee’s moves into his style of boxing. “Enter the Dragon” is Manny’s favorite movie and he still watches Bruce Lee’s movies to see if there is anything he has missed. Conditioning coach Alex Ariza says that “Pacman” used Bruce Lee as a model for the moves he now uses. The early Pacquiao had speed of hand and foot and even then he had uncommon power for a fighter his size. Pacquiao adviser Mike Konz noted that Manny has huge calf muscles and said that thick legs are a family trait, also saying that he has great strength in his torso. Sparring partner Shawn Porter said that with Manny his combinations are not thrown 1-2-3, but more like 1-2-3-4-5-6 and are all thrown with power. When Erik Morales defeated Pacquiao in 2005 trainer Freddie Roach decided that his fighter needed some balance and went about teaching Manny how to incorporate his right hand into his attack. Roach got Manny to practice throwing jabs, uppercuts and hooks all thrown with his right hand in four punch combinations. It took time, but a new fighter emerged against David Diaz. Later Pacquiao would knock out Ricky Hatton with a right hand. Roach now divides Pacquiao’s career into two parts: Pre David Diaz and after David Diaz. Manny’s style was now taking shape. Roach says that although he has trained many champions none of them have had the total commitment to their craft that Manny does. A lot of the work that Pacquiao does with his footwork and creating angles to confuse opponents has been an invention that Manny himself has incorporated into his technique. Roach and Pacquiao design every fight specifically for the opponent “Pacman” will be facing. Roach said that one of his fears when Manny continued to move up in weight was that he would lose his speed and explosiveness. That has not happened which has caused some of his detractors to accuse him of steroid abuse. Both Roach and conditioning coach Ariza categorically deny those allegations, noting that he has never failed a test and attributing his success to altering his diet, advanced isometric training and plyometric training for explosiveness. Part of Manny’s success is his God given natural ability coupled with his optimism. He has great reflexes and his at rest pulse rate is 42 beats per minute. It seems to be that more and more of the boxing world is accepting Manny Pacquiao as a great fighter. Whenever Manny’s name comes up, Floyd Mayweather’s name also comes up almost by default. This is the fight boxing fans all over the world want to see and have wanted to see for the past couple of years. It would seem that the legacy of both fighters would be damaged if this fight never comes to pass.